The ICMAB hosts this year six students from the UAB Argó Program. They will be with us during the mornings, from June 26 until July 13. Once again, the UAB offers high-school students the possibility of doing a research stay at the UAB or in one of the research centers of the UAB campus, to get to know the tasks that are usually carried out in laboratories, departments,or research institutes. ICMAB has been collaborating with the Argó Program and hosting students since 2011. The stays provide students with first-hand guidance and advice from the researchers and technicians of the center, as well as the possibility to interact with the researchers and explore the scientific activities they carry out. At ICMAB, the students will learn some of the techniques used by researchers to characterize the materials they synthesize, such as transmission and scanning electron microscopy, atomic force microscopy, magnetometry and X-ray diffraction. Judith Oró, Ana Esther Carrillo, Andrés Gómez, Bernat Bozzo, Maite Simón, Anna Crespi and Guillermo de Andrés Iglesias are in charge of organizing the different actrivities and sessions. 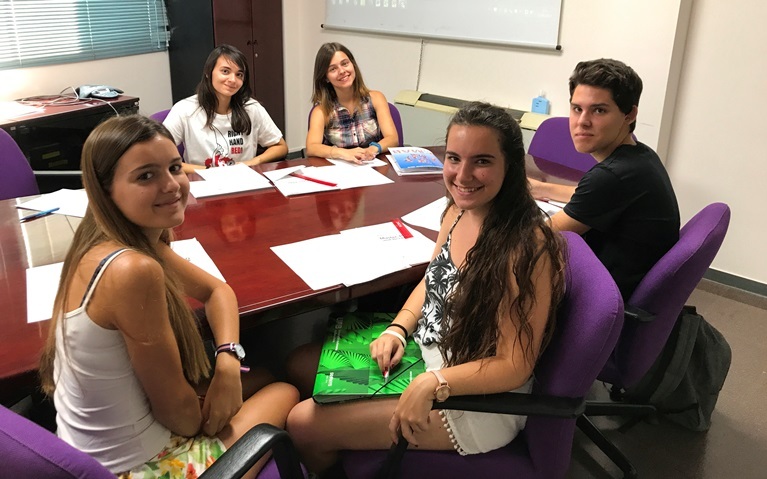 The students, Ariadna Arias, Ruth Meiriño, Oscar Roca, Cristina Lamas, Sara Prats and Manel Serrano, come from different places (Cerdanyola, Barcelona, Sant Andreu de la Barca, Hostalric...) but they all have a common interest: get closer to science and to the world of scientific research. They all want to pursue a scientific carreer, some of them even know what they want to do (study chemistry, work with graphene, do research in nanoscience...) but they still need to decide how to get there.